Honestly, I have not painted since I was in elementary school (except one attempt at watercolors with my aunt about a decade ago). So when I decided to try out the “Art With a Splash” shop on State Street in Portsmouth, I was not sure what I was getting into. I took a while deciding which night to try my hand at painting with acrylics on canvas. You see it was not just a matter of finding a night when I was not already busy, but also a night when the subject painting looked appealing (and not too hard). 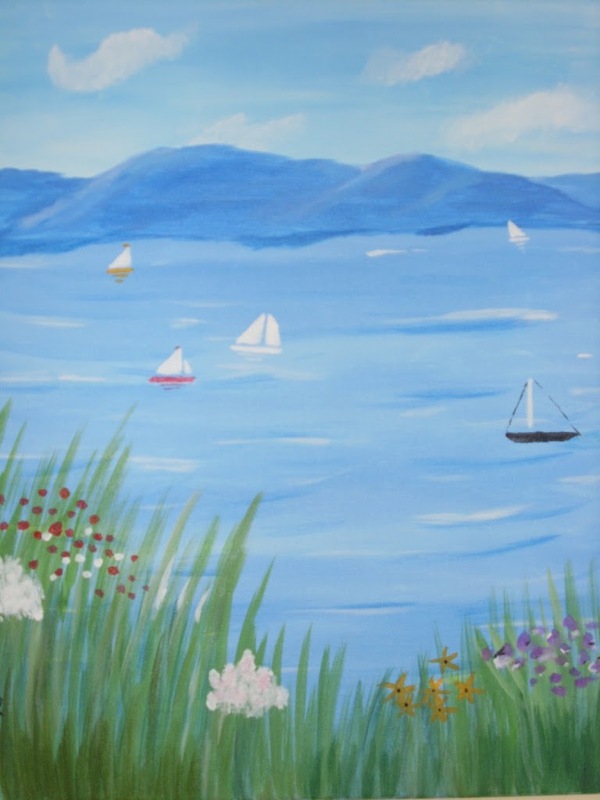 So one quiet Thursday night, I joined about 15 other intrepid, budding painters to try my hand at a lovely seascape with mountains, sailboats and lovely flowers in the foreground. Everything is waiting for you, all the paints, palates, smocks, brushes and canvases. All you have to bring (if you want) is some wine or other favorite beverage and maybe some snacks. Give this some thought, because you are going to be there for at least two fun hours creating your masterpiece. So we get settled at our table with easels and canvas. All eyes are turned to the back of the shop where Jim, our instructor, stands ready with his blank canvas and the original that we will be working from. Mind you, I don’t say “copy” because everyone’s will be different and that’s the way they like it at Art With a Splash. Over the course of the evening, I mix colors, try different brush techniques, get bailed out of a bad bit of prospective rendering and generally have a great time. My neighbor has a much bolder style with her palate and she has broad strokes running through her sky and seascape. Across the way, another customer has a way with the mountains, giving subtle depth to the valleys between the hills. And here it is, my masterpiece! By the time I walked home that night with painting in hand, I was decided that a return visit was certainly in order. I’ll have to keep my eye on the works of art coming up in the next few months until one grabs me. Look at the calendar of paintings for yourself and see if an evening with wine, cheese and art may not be just the memory to paint for your Portsmouth vacation. Art With a Splash is located at 222 State Street, Portsmouth, NH and can be reached at 603-427-8251 to make reservations or book through their website. You can walk back to the Martin Hill Inn after your moment of artistic expression in just 10 minutes.